This set of Linear Integrated Circuit Multiple Choice Questions & Answers focuses on “Integrated Circuit Package Type, Pin Configuration and Temperature Range – 2”. 1. Find out the op-amp which does not have same specifications and behaviour as that of N5741? Explanation: All these op-amp have the same they specifications and behave the same because the last three digits in each manufacturer designation is 741. For example Fairchild’s original µA741 is also manufactured by various other manufacturers under their own designation. Explanation: The 741C and 741E are identical to 741 and 741A except that the former have their performance guaranteed over a temperature range 0o to 70o or 75oc. 3. Which of the following is a military grade op-amp? Explanation: The 741S is a military grade op-amp with a higher slew rate (rate of change of output voltage per unit of time) than the 741 op-amp. Explanation: First generation op-amp has no short circuit protection. The op-amp is susceptible to burnout if output accidentally shorted to ground. 5. What is the disadvantage of integrated circuit? Explanation: The disadvantage of IC is that, a lack of flexibility an IC. It is generally not possible to modify the parameters within which an integrated circuit will operate. Explanation: Each manufacturer uses a specific code and assign a specific type number to the IC’s produced. That is, each manufacturer uses their own identifying initial followed by IC type number. Explanation: Audio power amplifier is a special purpose op-amp and is used only for the specific application they are designed for. Explanation: In hybrid IC, first the individual components are made, wired or metallic interconnection is done and finally they are diffused to form a single circuit. 9. Which is the different version of IC 741C? Explanation: 741SC is the different version of 741C IC, which is a commercial grade op-amp with higher slew rate and operating in the same temperature range. Explanation: All the IC belongs to second generation op-amp. In that general purpose op-amp’741’ is used widely in greatest percentage of application. 11. What is the advantage of Hybrid Integrated Circuit? Explanation: In hybrid integrated circuit miniaturization can be achieved and allow circuit designer a complete freedom in choosing the resistor values, whereas monolithic IC cannot use some important components on construction. 12. Find the pin configuration of µA741operational amplifier? Explanation: The metal can configuration of µA741 op-amp has eight pins with pin number 8 identified by a tab. The other pins are numbered counter clockwise from pin 8, beginning with pin1. 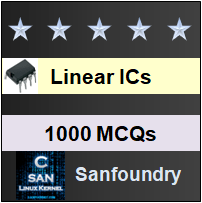 To practice all areas of Linear Integrated Circuit, here is complete set of 1000+ Multiple Choice Questions and Answers.